The Norfolk used to be “that place under House Of Crabs” to me, where the food was decent, but not the main attraction. But now, there’s a whole new menu, and a few of us were lucky enough to get invited to feast! 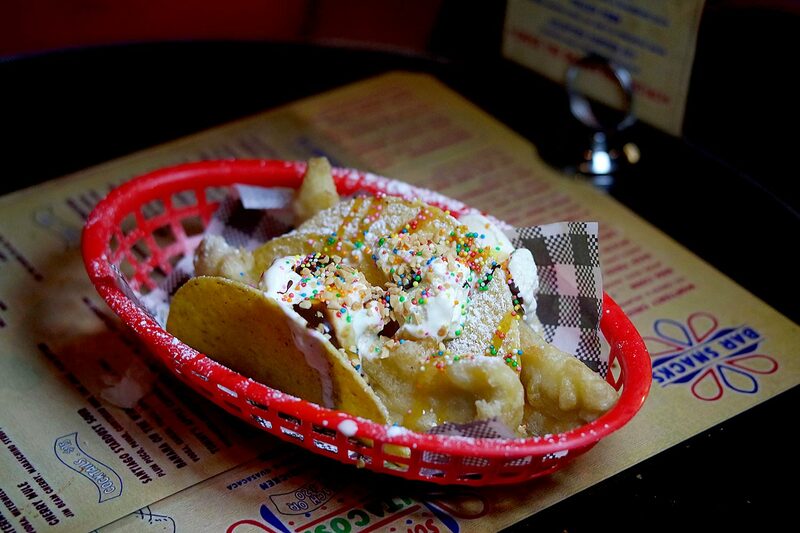 Deep fried banana taco anyone? But before dessert, the bar menu. The corn with ancho mayo, bacon and pretzel furikake should be how all corn should ve had, with smoky crusty salty deliciousness to be had all around. If this is how all veggies are served, I’m sure you wouldn’t have issues making kids eat their veg. The Monterey Sliders were also pretty groovy, bringing all the cheesy comforts in every bite. There was an extra one floating around the table, and it was all I could do (and the belt that I was wearing) that stopped me from going for seconds. And for tha Mac and Cheese lovers, The Norfolk is turning it up a notch with Mac and Cheese Balls. Finally, the perfect crumb to ooey gooey goodness ratio. This came with a dipping sauce, which was somewhat non-essential, since every ball of mac has the cheese to dress itself. The Deep Fried Banana Taco was the last dish of the night, and served with a flourish it was. It had all the hot/cold sweet/savoury things going on, but at that point I was so stuffed that I wasnt sure what I was really eating anymore. But I did finish the banana though, because, uh, deep fried fruit is good for you right? Insatiable Munchies dined as guests of The Norfolk and Drink and Dine.